Last month I treated myself to a new computer build. My Sandybridge 2600k CPU has been by my side since 2012, but I find I’m pushing it to its limits and need more power. I’ve re-purposed the build into a second gaming PC, so it is still humming along at my house. I’m just not its primary user anymore. No case? No problem! Time to test my upgrade! I regularly hit the 32GB limit of memory that my CPU and motherboard supports when running virtual machines and other tasks on my computer. I notice a performance hit when playing games when multitasking, for example when I’m watching Twitch streams. When the initial reviews for Broadwell-E were released I was disappointed. A lot of high expectations were killed in their tracks, such as high overclocks, but I saw some gains in the new architecture. For one, the memory controller supports faster memory. This is important for me, since I’m buying some fast DDR4 to go with my purchase. Why? DDR4 is relatively inexpensive at the moment, and there are some reviews out there that show higher speed ram helps improve minimum frame rates. This review shows how even though Sandybridge fairs well with average frame rates, it tends to have more difficulty maintaining consistent frame output. This is turn results in stuttering or slight hangs in more demanding scenes. Is it finally time to upgrade your Core i5 2500K? Intel Core i3 6100 Skylake Review – The Best Budget Gaming CPU? Both of these reviews show that the old age arguments of “1600Mhz DDR3 is more than enough” or “fast memory is overrated” might not be looking at the whole picture. It’s not necessarily max frame rates, but I’d rather keep frame time consistent or minimum frame rates high as I feel this translates into a better gaming experience. Unfortunately, this opinion has yet to gain popularity in favour of “OMG! Max framerate only went up by 2%!”. How does the new system feel? I’ve had a chance to play Battlefield 4, CS:GO, and World of Tanks with the new setup. All I can say is that each game feels “buttery smooth” in comparison. It honestly feels like a much better experience and I kind of wish I hadn’t waited so long to upgrade. Oh, and Twitch/VM’s and gaming is a thing now, and I’m able to multitask without any noticeable performance hit. If I didn’t have a need for a second gaming PC I would have stayed with my Sandybridge system a while longer. However, this need is what convinced me it was time to upgrade and I’m honestly glad I did. 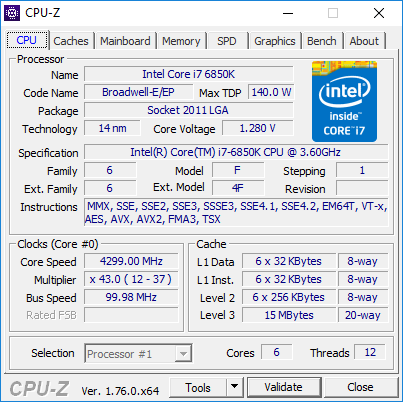 Broadwell-E overclocked on air!? How!? 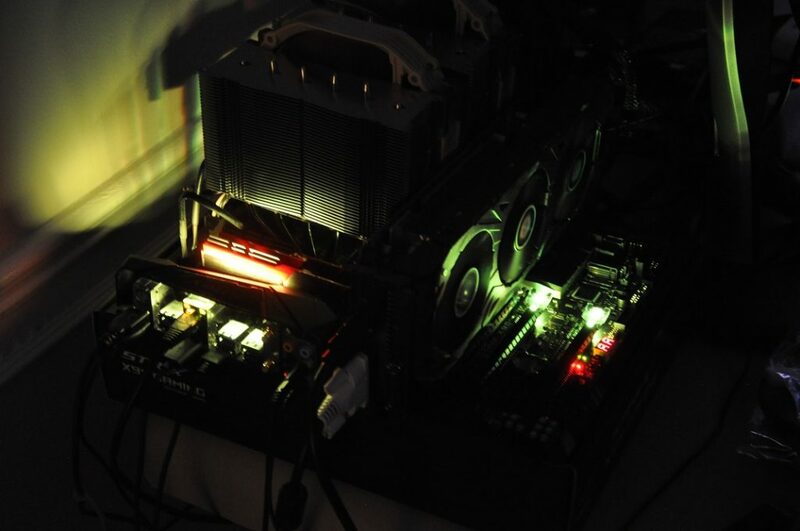 This came up on the Overclock.net forums. 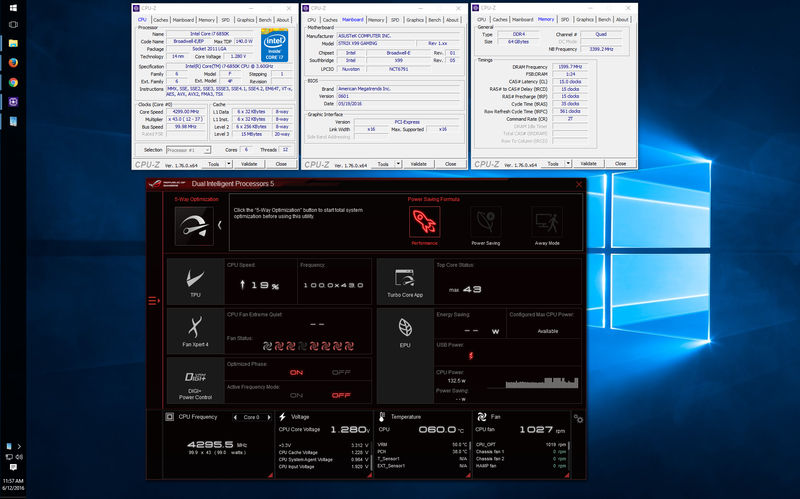 The initial reviews show really poor overclocks for the 6800k in particular, which is one of the reasons I opted for the 6850k. I figured I’d just have a better chance at keeping the temperatures down since the review samples of the 6850k handled higher overclocks on lower voltage. 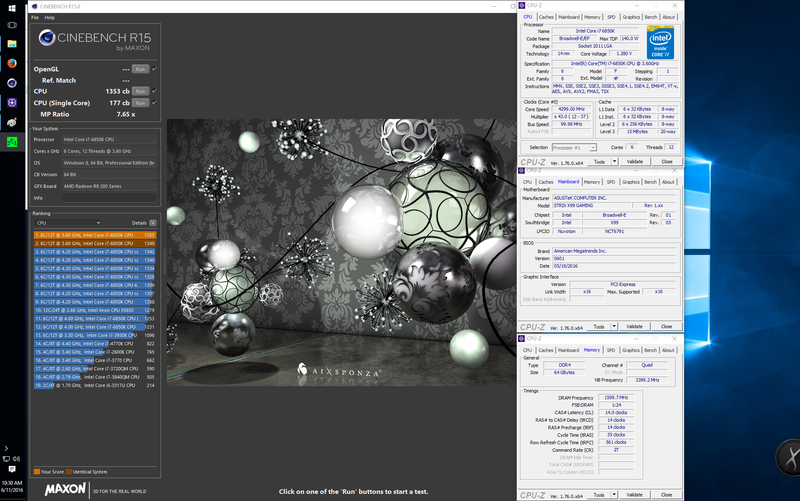 I was shooting for a 4.3ghz overclock but I’m still not fully stable at 1.28v. My 64GB of DDR4 is probably a factor here, but I backed off to 4.2ghz for now until I can take another look. I’ve been fully stable at 4.2 for a couple of weeks now. With my current overclock I top out at around 77-78C when stress testing with avx instructions, but the CPU stays between 60 – 70C for other heavy loads (with an ambient temperature of around 25C). It’s a bit warm as I’m still using air cooling, but I’ve yet to run into any overheating issues with my setup. Fully stable at 4.2 but here’s an attempt at 4.3. I’m very happy with my upgrade and look forward to have a new system that will serve me well in the future. It’s been one of the easier builds I’ve worked on so it was fun to get this system up and running to see what it had to offer. Maybe you’re reading this and trying to decide on what to do. If so, I hope you’ve found this review to be helpful and offers some insights you might not have found elsewhere. I don’t think jumping to X99 is for everyone. Keeping your existing build is more than okay too! Everyone’s situation is different. If you insist on a new build my advice would be to try to wait and see what AMD’s Zen line has to offer this fall. Competition should help benefit you as a consumer and might help push down Intel’s prices. Alternatively, you might just want a small upgrade while you wait for something new to release. If so, consider grabbing an SSD (if you don’t already have one) or take a look at your graphics card or memory. You can always carry some parts to your new system or sell them after you upgrade. Here’s the issue. You just modified a table and added or changed a column, but now you have that squiggly line when you’re focused on writing queries. There we are! Fixed! We’re back in business. This has been something that’s bugged me in the past when working on tables/views/stored procedures, but ever since I found out about this trick it’s made designing databases much easier. The following shows you a low-cost fix to reattach the earpiece material to the base your Plantronics RIG Headset if has detached from the base of the unit through normal use. Note/Disclaimer: This fix will void your headset warranty. Don’t blame me if my steps don’t fix your issue, make things worse, prevent you from getting warranty support afterward, or need to replace your headset. Follow safety instructions and use common sense. 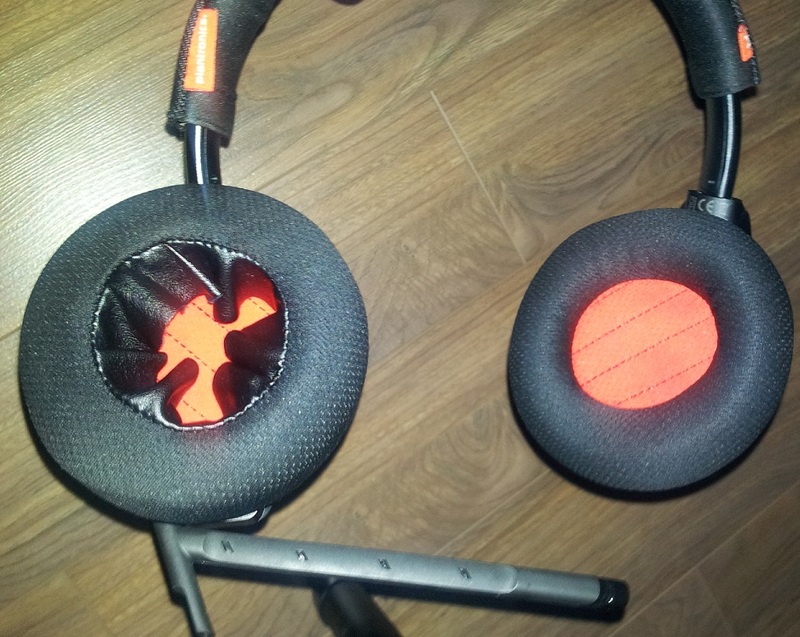 Despite taking care of my headset for almost a year, recently the fabric that hold the foam in place around one side of my headset gave way, preventing me from comfortably wearing the headset. While taking part in the Software Security course offered through Coursera, one of the projects requires you to setup a virtual instance of BadStore. BadStore is a deliberately vulnerable web application, which offers a hands-on approach to finding and exploiting web based vulnerabilities. It’s an older piece of software, but the material is still relevant today. 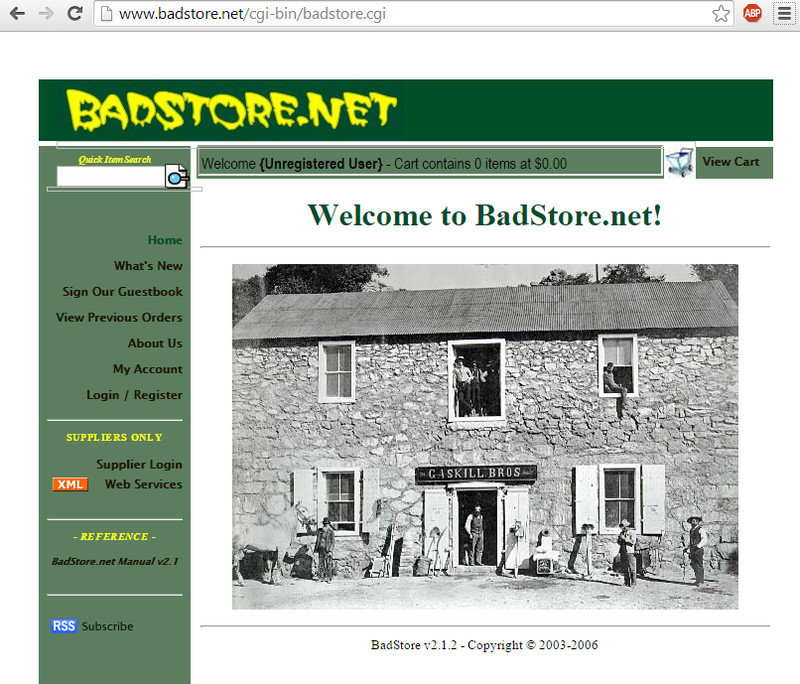 The BadStore site is ripe with vulnerabilities to practice your penetration testing skills with. BadStore is available at http://www.BadStore.net. I also have a copy below as the site was not responding when I was originally setting up the project. It required a couple of attempts for me to get it working under VMWare as this is based on an older Linux kernel, and seeing the questions on the discussion forums I figured I’d outline the steps to getting it setup for anyone who is running into issues. I spent some time this weekend re-organizing my dev environment and updating software to the latest versions. I’m hoping to take some time this week to working on some of my projects after work. The trouble is, I have tons of things I want to do but not enough time to tackle them all. I might see what state the Android apps are currently in and go from there. First up is a bug I ran into while playing Far Cry 3 this weekend. I couldn’t help but laugh when I encountered this poor bird who will tucker himself out in flight but isn’t going to relocate anytime soon. For those checking up on things hello, and well, this post for for you! Things have been busy as usual it seems and I haven’t been updating the site as much as previously promised. It’s been a busy and sad year overall with personal matters to tend to during the summer months so development has slowed down signifigantly as a result. That being said, I’ve started to turn around and thinking about new projects or features to work on which reminded me of posting an update on the web site so here we go. I’ve started brainstorming for a new game using Unity and am beginning to flesh out more details on what I’d like to create. I did update both School Scheduler and Price Compare at the end of the summer and implemented some new features and functionality, including my first widget on the Android platform. All-in-all the deployments of these updates went over very smoothly and I’m pretty proud of myself for that. Along with my side-job developing for Cryptopone Software I work a full time job, and needless to say a lot of my free time has been spent winding down playing various games and learning about new and interesting topics. Computer/Network/Information Security is still a subject very close to my heart and is something I spend a lot of time reading up on and thinking about. But when it does come to kicking back and having some fun, outside of work, I am a gamer at heart and as of late my time has been filled by playing World of Tanks and GTA V.
Gaming has changed a lot for me over the years, and my previous work history has helped me appreciate how much effort goes into greating a virtual world to immerse gamers into. I’m not sure if it’s competition, sheer volume of games… or just growing up that has made enjoying games much more difficult compared to years past. Before, I could rent a game for a weekend and immerse myself in the world, following the rules laid out by the developers to play the game they designed. As years have gone by, games have been played, and as a part of growing up, I’ve been less interested in the actual game rules laid out and have been more interested in the actions that can be performed as a result of the rules that have been laid out. More specifically, I enjoy exploiting the actions that are available to me as a result of use cases that remain undefined or were never thought of in the original development. I’m of course, referring to the metagame. My time playing GTA V Online has made me realize this more and more, as I can’t remember the last time I’ve had this much fun playing a videogame. The amount of laughter that has come out of me the past couple of weeks has been insane. I think years ago playing Left 4 Dead 2 and Team Fortress 2 with friends has been the last time I’ve had such a great time playing a game. Perhaps actively seeking the metagame could be considered a skill, and is something I should document for both my own and others benefit. As a result, I’m considering documenting some of my metagame thoughts and comments with regards to GTA 5. I’ll gather some info on some areas that I’ve been actively embracing and post it for the world to see and discuss.